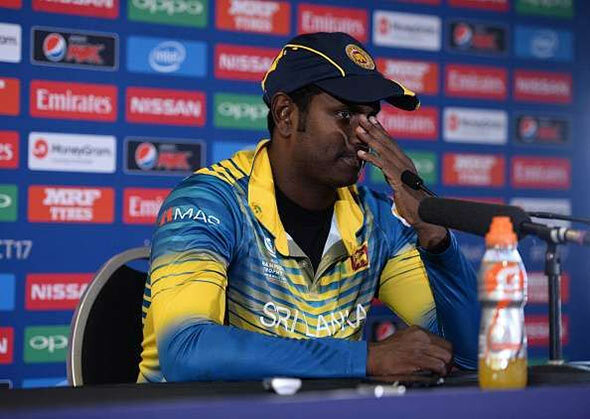 Following Sri Lanka’s humiliating defeat at the hands of Zimbabwe on Monday, Sri Lanka captain Angelo Mathews has put down his papers as the skipper of all three formats of the game. After the final ODI against Zimbabwe at Suriyawewa, which Sri Lanka lost by three wickets, Mathews had hinted at a discussion about his future with the selectors. He officially communicated his decision on Tuesday. Mathews captained Sri Lanka in 93 ODIs of which they won 47; 34 Tests, of which the team won 13. In T20Is, meanwhile, he won four and lost seven. However, his captaincy came under the scanner after the Zimbabwe series which Sri Lanka lost 2-3. This was also the first overseas win for the visitors, Zimbabwe, in eight years. After Sri Lanka’s poor outing in the recently concluded Champions Trophy, their head coach Graham Ford stepped down, following which their fielding coach Nic Pothas took over the reins for the Zimbabwe series. Mathews, meanwhile, was initially the captain of his college cricket team, followed by the Sri Lanka U-19 team, after which he led the Sri Lanka ‘A’ side. At the age of 25, in 2013, he became the youngest Sri Lankan Test captain, when he took over from Mahela Jayawardene. In 2016, Mathews was named the captain of the T20I side, taking over the reins from Lasith Malinga who was battling with a spate of injuries at the time. Following Mathews’ resignation, Dinesh Chandimal is now the front-runner for the coveted post. Chandimal previously captained the national side in limited-overs-cricket. The wicketkeeper-batsman is also the current vice-captain in all three formats. Excellent decision Matthews, time to realise that your leadership is dud. Had I been in your shoes, I would have resigned the captaincy when Zimbabwe were 139/0 chasing your total of 203. Bye Matthews, cannot say you did your job well. The selectors will, I presume, drop you from the team as batsman. Good Decision Angelo. You should have done this long time ago. It does not make sense to walk away from the team when it needs you most. The need for leadership is critical when the team is at its lowest ebb and not when the team is flying high. We need the Captain to take responsibility, more at the time of failure than at the time of success. Responsibility includes a determination to work hard and inspire the team towards success. It will also do good to listen to those who offer criticism and build on the wisdom arising from criticism. Running away at times of distress will not help anyone. In fact running away from responsible leadership will damage team morale, even more. The Captain’s decision to walk away reflects poor leadership qualities.